On Thursday morning, I visited St. Jude’s Church for 7:15 am Mass. The celebrant was an American priest, but, otherwise, everyone in the “church” was a Hong Kong native. 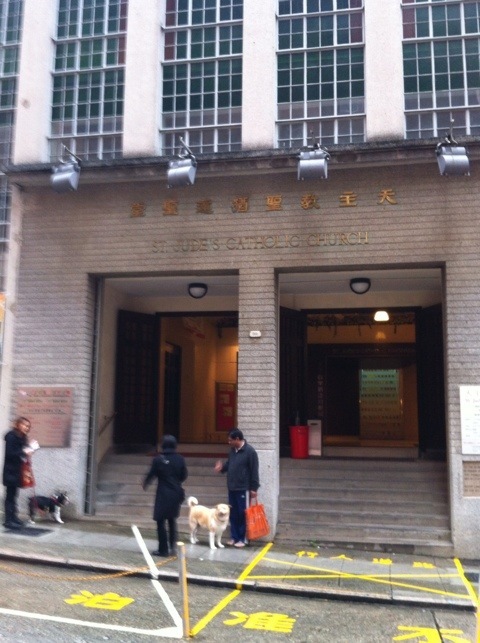 The Mass was in Cantonese, so I had to follow along knowing the rhythms of the Mass. I like going to Mass when I visit exotic places because it is always an opportunity to experience full local authenticity. I was not disappointed. St. Jude’s is a combination church and kindergarten. While there is a real church, the Mass was held in what looked like a conference room with folding chairs as pews. Except for the strange language, it was the same Mass that I attend in Washington and Boston. In fact, it is the same Mass that has been celebrated in every corner of the world every day for 2,000 years. There is something remarkable about that. Upon receiving Communion, the deacon switched to English and said “Body of Christ,” for me. Nice touch. From there, I walked the mile back to the hotel along King’s Road, which is a block in from the harbor and is a large commercial street. Got to see a typical morning with mobs of people hustling to work. Didn’t feel quite so exotic, but interesting, nonetheless.